The City of Topeka, through grant funding from KDOT, is working toward building a bikeways master plan, including suggested bike routes, bike lanes, paths, and shared facilities. The study will be a guide for future transportation development in Topeka. Please take a moment to participate in this survey. The results may help determine the future of bicycling in Topeka. 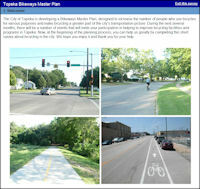 The Topeka Bikeway Master Plan is being developed by RDG Planning & Design, which has created a web site for the project with news, information, and materials related to the development of the master plan. One interesting document they’ve created is an Infrastructure Alternatives presentation, which provides a look at some existing Topeka streets and possible improvements from around the nation and the world. 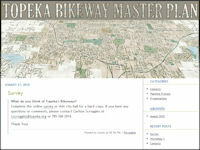 The Topeka Bikeways Master Plan Survey asks questions about your current bicycle usage, asks for your comfort level with a number of current Topeka street configurations, and seeks your opinion on the improvements you’d like to see. The survey is open to all (not just Topeka residents), so please take the time to complete the survey and get the Topeka Bikeway Master Plan kicked off right, and to help make bicycling a greater part of the city’s transportation future.